Happy New Year! I can not believe it is already 2015. I feel like just yesterday I was bringing in 2014 with my mom on our couch sipping champagne. I feel as I get older, the time goes by way faster. I am constantly thinking about the past, and how a month ago was already a month ago, if that makes any sense? I wish there were more hours in the day, because I can't even keep up with how fast this world moves. I woke up at 1 PM today (I was exhausted from NYE, haha) and now it's already almost 4. The sun sets here in Boston at around 4:30-4:45 everyday, so it makes my days about 4-5 hours long, which I really really hate. I have to cram a lot of stuff into those minuscule hours of daylight! But today, I have a product review for you! I feel like I haven't done one of these in ages. Today I am going to review the Hourglass Ambient Lighting Palette that I got for Christmas! To be honest, I have been using this palette everyday since I got it. I love mixing the shades to create different looks. So, this palette is $58 for 0.33 oz of product, which isn't amazing, but I feel like the product itself and the beautiful packaging make up for the lack of product. Obviously, the palette has three blushes, one in which is exclusive to the palette itself (Incandescent Electra). The other two shades, Mood Exposure and Luminous Flush can be bought separately, and are very similar to their stand alone products, but do vary a little with the swirling in each pan. All three of these blushes have a very silky, soft feel. They can get a bit messy in the pan, (i.e powdery) but when applied, look flawless. They are all very blend-able and can be built upon when using more product. The blushes definitely have multi-dimensional color. The first shade in the palette is Luminous Flush. It is described as a "Champagne Rose". It's a pink-coral color with satin sheen. I think this color has great payoff, and has a silky texture to it. It looks amazing with a neutral eye and some coral lipstick. 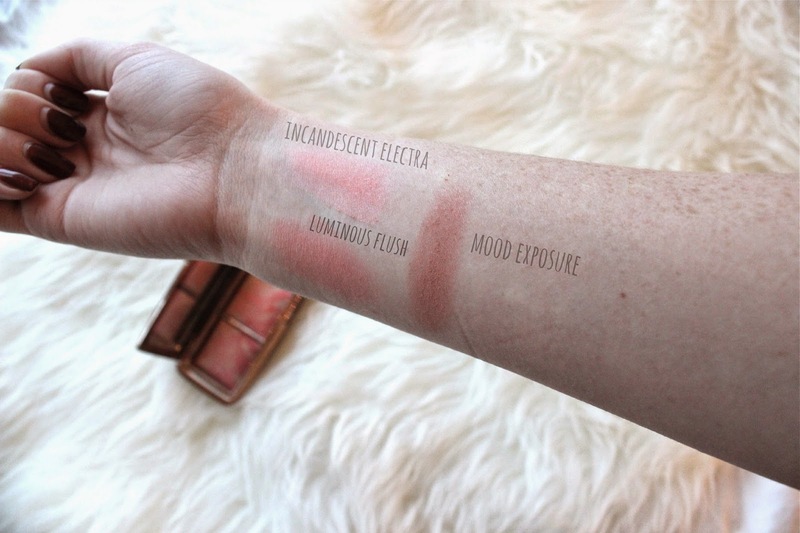 The middle shade is Incandescent Electra. This color is definitely more of a peach color, and has warm undertones. The texture is soft and silky just like the other blushes, and I think from the looks of it in the pan, has good pigmentation. I love mixing this color with luminous flush to get the perfect coral cheek. The last shade is Mood Exposure. I actually have a full size of this blush. It's described as a soft plum color and has warm undertones to it. It has a shimmer-sheen pay-off, but I would say it's definitely more of a sheen that a shimmer blush. The texture is beautiful and I love how it's not normally a blush I would use, but I'm trying to incorporate it within looks to experiment! Overall, I would give this product a 9 out of 10. The finishes are pretty soft, but are build-able, like mentioned. I have an extremely fair skin tone, so the blushes do look different on me, but if you have a medium or darker skin tone, these blushes could easily look similar on the face when applied. I've read some other reviews and people with darker skin-tones have had problems with the blushes looking the same when applied. Buy the palette here and the NARS brush here.